Premium textured lustre finish minimizes glare and reflection while maintaining excellent color saturation. Features a low melt adhesive system. 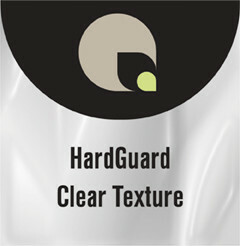 Unlike its competitors, HardGuard Clear Texture is a one-piece construction that’s free from silvering problems. Back with HardGuard Light Stopper for a virtually indestructible finished product. Thickness 5 & 10 mil.